Assembled Dimensions: 57D x 29.5W x 52.5H | Weight: 245.00 lbs. To the original owner of The Pedicute Portable Spa, Continuum Footspas may repair or replace, at its option, any Pedicute Portable Spa found to be defective in material or workmanship upon inspection by a factory authorized representative of Continuum Footspas. Pedicute: including “Shell” and Heater/Massager unit - Three (3) years from date of shipment from Continuum Footspas facility. Pedicute Pedicure Tub: life-time limited warranty. Accessories: One (1) year from shipment from Continuum Footspas facility. Portable Spa of equal style. 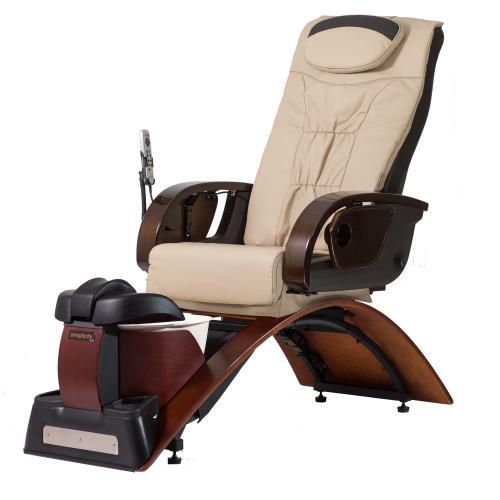 Owner is responsible for all labor and shipping costs necessary to replace a Pedicute Portable Spa. Pedicute Portable Spa is subjected to improper maintenance, negligence, improper cleaning or any other circumstances beyond Continuum Footspas control. 2) Damage due to freight, accident, natural disaster and/or abuse. 3) Staining, fading or discolorization of any accessories, wood surfaces or any of the three (3) foam support pads located on the front of the Pedicute. This limited warranty is to the original owner and is not transferable. The original owner agrees by using The Pedicute Portable Spa the obligation of Continuum Footspas shall not extend to indirect or contingent damages or injury. Furthermore, the obligations of Continuum Footspas are limited to those set forth herein. This limited warranty is the exclusive remedy and is in lieu of all other warranties, express or limited, including, but not limited to, any implied warranty of fitness or merchantability for a particular purpose. No distributor, dealer or other person has the right or authority to bind Continuum Footspas to changes to this limited warranty. Consequently, Continuum Footspas is not responsible for such warranties or representations. Any assistance Continuum Footspas provides to the original owner above and beyond the scope of this limited warranty does not constitute a waiver of such terms, limitations or exclusions. Furthermore, such assistance does not extend this limited warranty. Continuum Footspas shall not be liable for any other obligations or liabilities as a result of breach of contract of warranty, negligence or strict liability with regards to The Pedicute Portable Spa. This Limited Warranty applies only to Pedicute Portable Spas utilized in any one of the fifty states of the United States, the District of Columbia or provinces of Canada. 1 Year parts Warranty againts manufacturer defect.